When you step aboard Air Tahiti Nui, you’ll find yourself transported to the charm of the French Polynesian islands. The cabins create a relaxing environment that reflects the culture, allure, and natural splendour of Polynesia. Their colours evoke sensations akin to what you will experience when arriving in Tahiti: the warmth of the woods, the intensity of the oceans and lagoons, the luminosity of the islands, and the freshness of the lush foliage. Air Tahiti is delighted to extend the traditional Tahitian hospitality to make you feel welcome and at home in Tahiti. 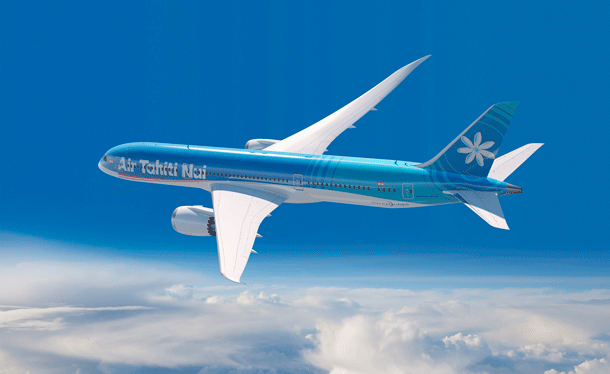 The Dreamliner fleet signifies the start of a new chapter in a proud history of connecting Tahiti with the world. Believed to be the best aircraft flying the skies, the Boeing 787-9 has been selected and made uniquely Tahitian. 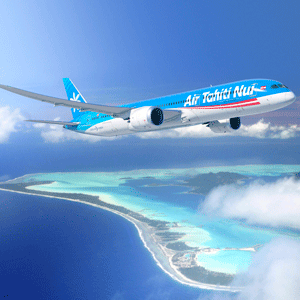 Come and fly with Air Tahiti Nui and be among the first to be carried to your dream destination on the wings of Air Tahiti’s new Dreamliner.